When Yahoo and AOL came together a year ago as a part of the new Verizon subsidiary Oath, we took on the challenge of unifying their identity platforms based on current identity standards. Identity standards have been a critical part of the Internet ecosystem over the last 20+ years. 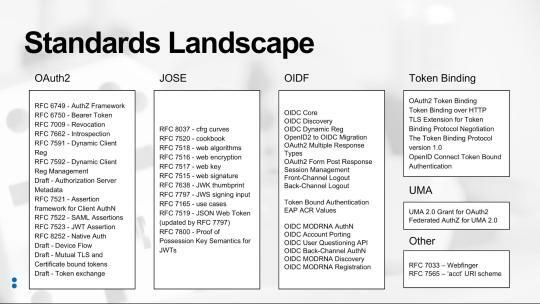 From single-sign-on and identity federation with SAML; to the newer identity protocols including OpenID Connect, OAuth2, JOSE, and SCIM (to name a few); to the explorations of “self-sovereign identity” based on distributed ledger technologies; standards have played a key role in providing a secure identity layer for the Internet. As we navigated this journey, we ran across a number of different use cases where there was either no standard or no best practice available for our varied and complicated needs. Instead of creating entirely new standards to solve our problems, we found it more productive to use existing standards in new ways. One such use case arose when we realized that we needed to migrate the identity stored in mobile apps from the legacy identity provider to the new Oath identity platform. For most browser (mobile or desktop) use cases, this doesn’t present a huge problem; some DNS magic and HTTP redirects and the user will sign in at the correct endpoint. Also it’s expected for users accessing services via their browser to have to sign in now and then. However, for mobile applications it’s a completely different story. The normal user pattern for mobile apps is for the user to sign in (via OpenID Connect or OAuth2) and for the app to then be issued long-lived tokens (well, the refresh token is long lived) and the user never has to sign in again on the device (entering a password on the device is NOT a good experience for the user). below) and finding the OAuth 2.0 Token Exchange draft specification (https://tools.ietf.org/html/draft-ietf-oauth-token-exchange-13). The Token Exchange draft allows for a given token to be exchanged for new tokens in a different domain. This could be used to manage the “audience” of a token that needs to be passed among a set of microservices to accomplish a task on behalf of the user, as an example. For the use case at hand, we created a specific implementation of the Token Exchange specification (a profile) to allow the refresh token from the originating Identity Provider (IDP) to be exchanged for new tokens from the consolidated IDP. By profiling this draft standard we were able to create a much better user experience for our consumers and do so without inventing proprietary mechanisms. During this identity technical consolidation we also had to address how to support sharing signed-in users across mobile applications written by the same company (technically, signed with the same vendor signing key). Specifically, how can a signed-in user to Yahoo Mail not have to re-sign in when they start using the Yahoo Sports app? The current best practice for this is captured in OAuth 2.0 for Natives Apps (RFC 8252). However, the flow described by this specification requires that the mobile device system browser hold the user’s authenticated sessions. This has some drawbacks such as users clearing their cookies, or using private browsing mode, or even worse, requiring the IDPs to support multiple users signed in at the same time (not something most IDPs support). While, RFC 8252 provides a mechanism for single-sign-on (SSO) across mobile apps provided by any vendor, we wanted a better solution for apps provided by Oath. So we looked at how could we enable mobile apps signed by the vendor to share the signed-in state in a more “back channel” way. One important fact is that mobile apps cryptographically signed by the same vender can securely share data via the device keychain on iOS and Account Manager on Android. Using this as a starting point we defined a new OAuth2 scope, device_sso, whose purpose is to require the Authorization Server (AS) to return a unique “secret” assigned to that specific device. The precedent for using a scope to define specification behaviour is OpenID Connect itself, which defines the “openid” scope as the trigger for the OpenID Provider (an OAuth2 AS) to implement the OpenID Connect specification. 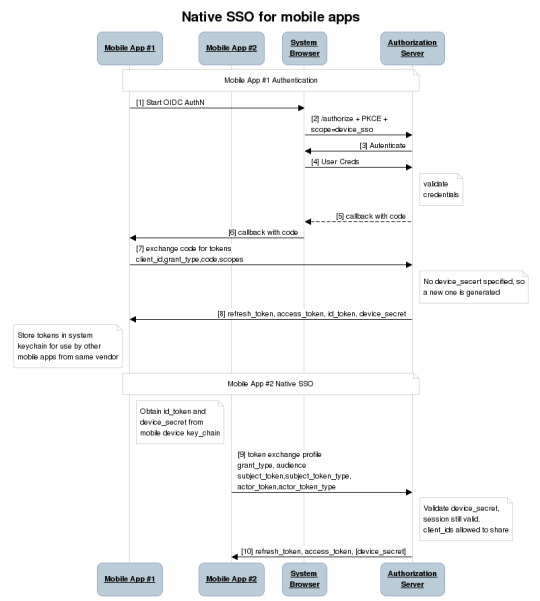 The device_secret is returned to a mobile app when the OAuth2 code is exchanged for tokens and then stored by the mobile app in the device keychain and with the id_token identifying the user who signed in. Spend time researching the existing set of standards and draft standards. As the diagram shows, there are a lot of standards out there already, so understanding them is critical. Don’t invent something new if you can just profile or combine already existing specifications. Make sure you understand the spirit and intent of the existing specifications. For those cases where an extension is required, make sure to extend the specification based on its spirit and intent. Ask the community for clarity regarding any existing specification or draft. Contribute back to the community via blog posts, best practice documents, or a new specification. As we learned during the consolidation of our Yahoo and AOL identity platforms, and as demonstrated in our examples, there is no need to resort to proprietary solutions for use cases that at first look do not appear to have a standards-based solution. Instead, it’s much better to follow these principles, avoid the NIH (not-invented-here) syndrome, and invest the time to build solutions on standards. 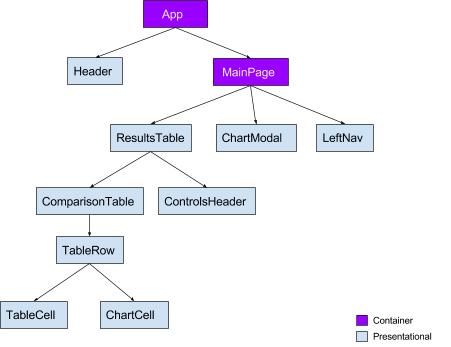 As engineers on the Yahoo Mail team at Oath, we pride ourselves on the things that matter most to developers: faster development cycles, more reliability, and better performance. Users don’t necessarily see these elements, but they certainly feel the difference they make when significant improvements are made. Recently, we were able to upgrade all three of these areas at scale by adopting webpack® as Yahoo Mail’s underlying module bundler, and you can do the same for your web application. webpack became our choice module bundler not only because it supports on-demand loading, multiple bundle generation, and has a relatively low runtime overhead, but also because it is better suited for web platforms and NodeJS apps and has great community support. How did we integrate webpack? Like any developer does when integrating a new module bundler, we started integrating webpack into Yahoo Mail by looking at its basic config file. We explored available default webpack plugins as well as third-party webpack plugins and then picked the plugins most suitable for our application. If we didn’t find a plugin that suited a specific need, we wrote the webpack plugin ourselves (e.g., We wrote a plugin to execute Atomic CSS scripts in the latest Yahoo Mail experience in order to decrease our overall CSS payload**). 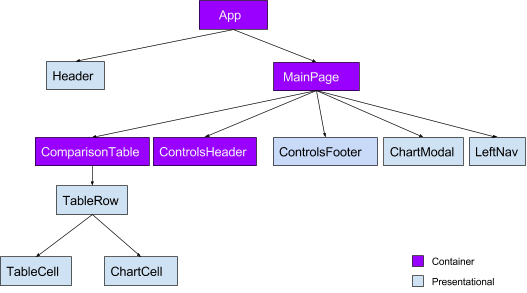 During the development process for Yahoo Mail, we needed a way to make sure webpack would continuously run in the background. To make this happen, we decided to use the task runner Grunt. Not only does Grunt keep the connection to webpack alive, but it also gives us the ability to pass different parameters to the webpack config file based on the given environment. 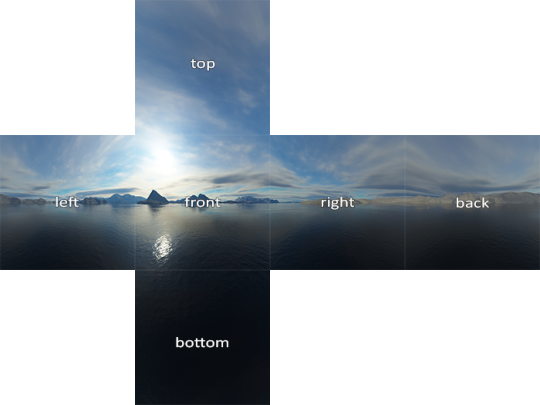 Some examples of these parameters are source map options, enabling HMR, and uglification. While developing a new feature, engineers ideally want to see their code changes reflected on their web app instantaneously. This allows them to maintain their train of thought and eventually results in more productivity. Before we implemented webpack, it took us around 30 seconds to 1 minute for changes to reflect on our Yahoo Mail development environment. webpack helped us reduce the wait time to 5 seconds. We were able to attain a significant reduction of payload after adopting webpack. 10% improvement in Yahoo Mail’s launch performance metrics, as measured by render time above the fold (e.g., Time to load contents of an email). Below are some charts that demonstrate the payload size of Yahoo Mail before and after implementing webpack. Every React component creates its own styles.js file with required style definitions. React-Atomic-CSS converts these files into unique class definitions. Our total CSS payload after implementing our solution equaled all the unique style definitions in our code, or only 83KB (21KB gzipped). During our migration to webpack, we created a custom plugin and loader to parse these files and extract the unique style definitions from all of our CSS files. Since this process is tied to bundling, only CSS files that are part of the dependency chain are included in the final CSS. When it comes to performance and reliability, there is perhaps no application where this matters more than with email. Today, we announced a new Yahoo Mail experience for desktop based on a completely rewritten tech stack that embodies these fundamental considerations and more. We built the new Yahoo Mail experience using a best-in-class front-end tech stack with open source technologies including React, Redux, Node.js, react-intl (open-sourced by Yahoo), and others. A high-level architectural diagram of our stack is below. A key feature of the new Yahoo Mail architecture is blazing-fast initial loading (aka, launch). We introduced new network routing which sends users to their nearest geo-located email servers (proximity-based routing). This has resulted in a significant reduction in time to first byte and should be immediately noticeable to our international users in particular. Rather than using custom libraries, we use native HTML5 APIs and ES6 heavily and use PolyesterJS, our homegrown polyfill solution, to fill the gaps. These factors have further helped us to keep payload size minimal. In addition to initial launch improvements, key features like search and message read (when a user opens an email to read it) have also benefited from the above optimizations and are considerably faster in the latest version of Yahoo Mail. We also significantly reduced the memory consumed by Yahoo Mail on the browser. This is especially noticeable during a long running session. We focused on independently deployable components. 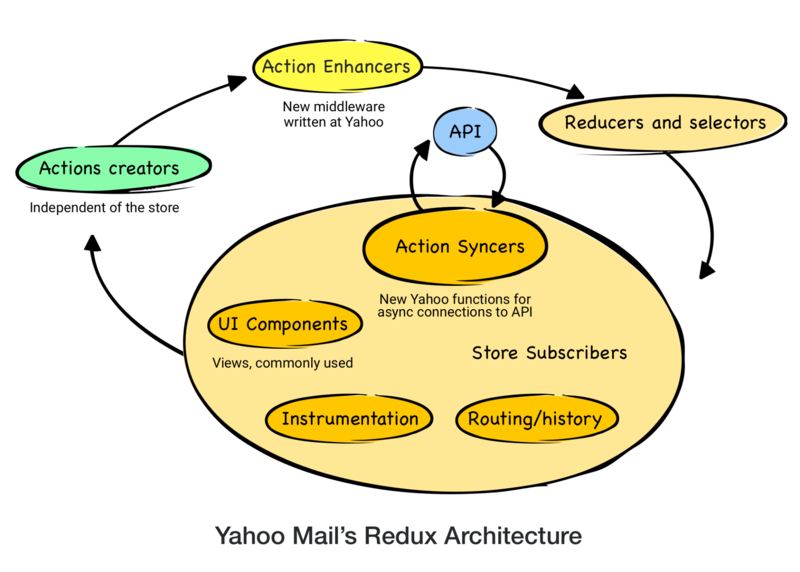 As part of the re-architecture of Yahoo Mail, we invested in a robust continuous integration and delivery flow. Our new pipeline allows for daily (or more) pushes to all Mail users, and we push only the bundles that are modified, which keeps the cache hit ratio high. 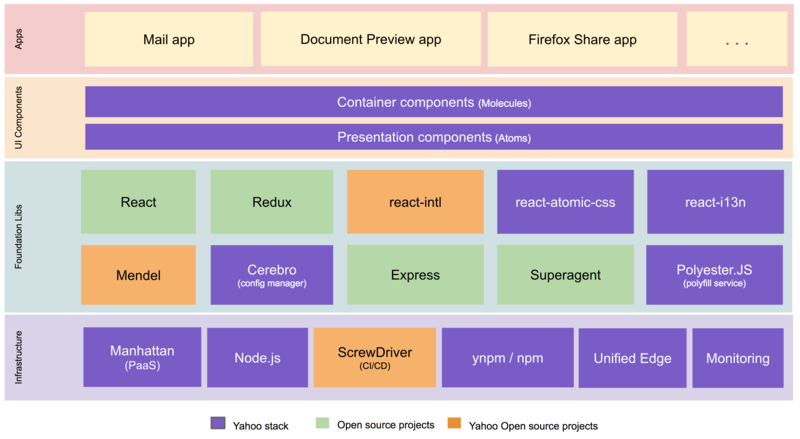 In developing our tech stack for the new Yahoo Mail experience, we heavily leveraged open source technologies, which allowed us to ensure a shorter learning curve for new engineers. We were able to implement a consistent and intuitive onboarding program for 30+ developers and are now using our program for all new hires. During the development process, we emphasise predictable flows and easy debugging. The accessibility of this new version of Yahoo Mail is state of the art and delivers outstanding usability (efficiency) in addition to accessibility. It features six enhanced visual themes that can provide accommodation for people with low vision and has been optimized for use with Assistive Technology including alternate input devices, magnifiers, and popular screen readers such as NVDA and VoiceOver. These features have been rigorously evaluated and incorporate feedback from users with disabilities. It sets a new standard for the accessibility of web-based mail and is our most-accessible Mail experience yet. We have open sourced some key components of our new Mail stack, like Mendel, our solution for bucket testing isomorphic web applications. We invite the community to use and build upon our code. Going forward, we plan on also open sourcing additional components like react-atomic-css, our solution for writing modular and scoped CSS in React, and lazy-component, our solution for on-demand loading of resources. Many of our company’s best technical minds came together to write a brand new tech stack and enable a delightful new Yahoo Mail experience for our users. We encourage our users and engineering peers in the industry to test the limits of our application, and to provide feedback by clicking on the Give Feedback call out in the lower left corner of the new version of Yahoo Mail. Building the technology powering the best consumer email inbox in the world is no easy task. When you start on such a journey, it is important to consider how to deliver such an experience to the users. After all, any consumer feature we build can only make a difference after it is delivered to everyone via the tech pipeline. We ensure that our engineers can push any code changes to all Mail users everyday, with the ability to push multiple times a day, if necessary or desired. This is possible because of the time we spent building a solid testing infrastructure, which continues to evolve as we scale to new users and add new features to the product. Every one of our builds runs 10,000+ unit tests and 5,000+ integration tests on various combinations of operating systems and browsers. It is important to push product updates regularly as it allows all our users to get the best Mail experience possible. Every code release starts with the company’s internal audience first, where all our employees get to try out the latest changes before they go out to production. This begins with our alpha and beta environments that our Mail engineers use by default. Our build then goes out to the canary environment, which is a small subset of production users, before making it to all users. This gives us the ability to analyze quality metrics on internal and canary servers before rolling the build out to 100% of users in production. Once we go through this process, the code pushed to all our users is thoroughly baked and tested. Running tests using web drivers on multiple browsers, as is standard when testing frontend code, comes with the problem of tests irrationally failing. As part the Yahoo Mail continuous delivery pipeline, we employ various novel strategies to recover from such failures. One such strategy is recording the data related to failed tests in the first pass of a build, and then rerunning only the failed tests in the subsequent passes. This is achieved by creating a metadata file that stores all our build-related information. As part of this process, a new bundle is created with a new set of code changes. Once a bundle is created with build metadata information, the same build job can be rerun multiple times such that subsequent reruns would only run the failing tests. This significantly improves rerun times and eliminates the chances of build detentions introduced by irrational test failures. The recorded test information is analyzed independently to understand the pattern of failing tests. This helps us in improving the stability of those intermittently failing tests. Our build and deployment pipelines collect data related to all the authors contributing to any release through code commits or by merging various pull requests. This enables the build pipeline to send out email notifications to all our Mail developers as their code flows through each environment in our build pipeline (alpha, beta, canary, and production). With this ability, developers are well aware of where their code is in the pipeline and can test their changes as needed. We have also created a pipeline to deploy major code fixes directly to production. This is needed even after the existence of tens of thousands of tests and multitudes of checks. Every now and then, a bug may make its way into production. For such instances, we have hotfixes that are very useful. These are code patches that we quickly deploy on top of production code to address critical issues impacting large sets of users. If we find any issues in production, we do our best to minimize the impact on users by swiftly utilizing rollbacks, ensuring there is zero to minimal impact time. In order to do rollbacks, we maintain lists of all the versions pushed to production along with their release bundles and change logs. If needed, we pick the stable version that was previously pushed to production and deploy it directly on all the machines running our production instance. As part of our continuous delivery efforts, we have also developed a concept we call heartbeat pushes. Heartbeat pushes are notifications we send users to refresh their browsers when we issue important builds that they should immediately adopt. These can include bug fixes, product updates, or new features. Heartbeat allows us to dynamically update the latest version of Yahoo Mail when we see that a user’s current version needs to be updated. In building the new Yahoo Mail experience, we knew that we needed to revamp from the ground up, starting with our continuous integration and delivery pipeline. The guiding principles of our new, forward-thinking infrastructure allow us to deliver new features and code fixes at a very high launch velocity and ensure that our users are always getting the latest and greatest Yahoo Mail experience. Big Data is no longer just Apache server logs. Nowadays, the data may be user engagement data, performance metrics, IoT (Internet of Things) data, or something else completely atypical. Regardless of the size of the data, or the type of querying patterns on it (exploratory, ad-hoc, periodic, long-term, etc. ), everyone wants queries to be as fast as possible and cheap to run in terms of resources. Data can be broadly split into two kinds: the streaming (generally real-time) kind or the batched-up-over-a-time-interval (e.g., hourly or daily) kind. The batch version is typically easier to query since it is stored somewhere like a data warehouse that has nice SQL-like interfaces or an easy to use UI provided by tools such as Tableau, Looker, or Superset. Running arbitrary queries on streaming data quickly and cheaply though, is generally much harder… until now. Today, we are pleased to share our newly open sourced, forward-looking general purpose query engine, called Bullet, with the community on GitHub. Run queries on real-time streaming data with the same convenience and flexibility as batch data. You get an API and a UI. Execute forward-looking queries on typed data with arbitrary schemas. One of the key differences between how Bullet queries data and the standard querying paradigm is that Bullet does not store any data. In most other systems where you have a persistence layer (including in-memory storage), you are doing a look-back when you query the layer. Instead, Bullet operates on data flowing through the system after the query is started – it’s a look-forward system that doesn’t need persistence. On a real-time data stream, this means that Bullet is querying data after the query is submitted. This also means that Bullet does not query any data that has already passed through the stream. The fact that Bullet does not rely on a persistence layer is exactly what makes it extremely lightweight and cheap to run. To see why this is better for the kinds of use cases Bullet is meant for – such as quickly looking at some metric, checking some assumption, iterating on a query, checking the status of something right now, etc. – consider the following: if you had a 1000 queries in a traditional query system that operated on the same data, these query systems would most likely scan the data 1000 times each. By the very virtue of it being forward looking, 1000 queries in Bullet scan the data only once because the arrival of the query determines and fixes the data that it will see. Essentially, the data is coming to the queries instead of the queries being farmed out to where the data is. When the conditions of the query are satisfied (usually a time window or a number of events), the query terminates and returns you the result. The Bullet architecture is multi-tenant, can scale linearly for more queries and/or more data, and has been tested to handle 700+ simultaneous queries on a data stream that had up to 1.5 million records per second, or 5-6 GB/s. Bullet is currently implemented on top of Storm and can be extended to support other stream processing engines as well, like Spark Streaming or Flink. Bullet is pluggable, so you can plug in any source of data that can be read in Storm by implementing a simple data container interface to let Bullet work with it. The web service can be deployed on any servlet container, like Jetty. The UI is a Node-based Ember application that runs in the client browser. Our full documentation contains all the details on exactly how we perform computationally-intractable queries like Count Distincts on fields with cardinality in the millions, etc. (DataSketches). An instance of Bullet is currently running at Yahoo in production against a small subset of Yahoo’s user engagement data stream. This data is roughly 100,000 records per second and is about 130 MB/s compressed. Bullet queries this with about 100 CPU Virtual Cores and 120 GB of RAM. This fits on less than 2 of our (64 Virtual Cores, 256 GB RAM each) test Storm cluster machines. In addition, Bullet is also used programmatically in continuous delivery pipelines for functional testing instrumentation on product releases. Product usage is simulated, then data is generated and validated in seconds using Bullet. Bullet is orders of magnitude faster to use for this kind of validation and for general data exploration use cases, as opposed to waiting for the data to be available in Hive or other systems. The Bullet UI supports pivot tables and a multitude of charting options that may speed up analysis further compared to other querying options. We also use Bullet to do a bunch of other interesting things, including instances where we dynamically compute cardinalities (using a Count Distinct Bullet query) of fields as a check to protect systems that can’t support extremely high cardinalities for fields like Druid. What you do with Bullet is entirely determined by the data you put it on. If you put it on data that is essentially some set of performance metrics (data center statistics for example), you could be running a lot of queries that find the 95th and 99th percentile of a metric. If you put it on user engagement data, you could be validating instrumentation and mostly looking at raw data. We hope you will find Bullet interesting and tell us how you use it. If you find something you want to change, improve, or fix, your contributions and ideas are always welcome! You can contact us here. Today, we are pleased to offer Daytona, an open-source framework for automated performance testing and analysis, to the community. Daytona is an application-agnostic framework to conduct integrated performance testing and analysis with repeatable test execution, standardized reporting, and built-in profiling support. Daytona gives you the capability to build a customized test harness in a single, unified framework to test and analyze the performance of any application. You’ll get easy repeatability, consistent reporting, and the ability to capture trends. Daytona’s UI accepts a performance testing script that can run on a command line. This includes websites, databases, networks, or any workload you need to test and tune for performance. You can submit tests to the scheduler queue from the Daytona UI or from your CI/CD tool. You can deploy Daytona as a hosted service in your on-prem environment or on the public cloud of your choice. In fact, you can even host test harnesses for multiple applications with a single centralized service so that developers, architects, and systems engineers from different parts of your organization can work together on a unified view and manage your performance analysis on a continuous basis. Daytona’s differentiation lies in its ability to aggregate and present essential aspects of application, system, and hardware performance metrics with a simple and unified user interface. This helps you maintain your focus on performance analysis without changing context across various sources and formats of data. The overall goal of performance analysis is to find ways of maximizing application throughput with minimum hardware resource and the best user experience. Metrics and insights from Daytona help achieve this objective. Prior to Daytona, we created multiple, heterogenous performance tools to meet the specific needs of various applications. This meant that we often stored test results inconsistently, making it harder to analyze performance in a comprehensive manner. We had a difficult time sharing results and analyzing differences in test runs in a standard manner, which could lead to confusion. With Daytona, we are now able to integrate all our load testing tools under a single framework and aggregate test results in one common central repository. We are gaining insight into the performance characteristics of many of our applications on a continuous basis. 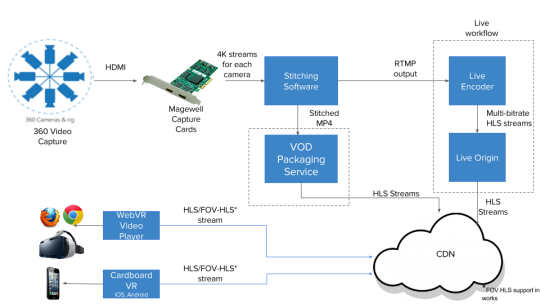 These insights help us optimize our applications which results in better utilization of our hardware resources and helps improve user experience by reducing the latency to serve end-user requests. Ultimately, Daytona helps us reduce capital expenditure on our large-scale infrastructure and makes our applications more robust under load. Sharing performance results in a common format encourages the use of common optimization techniques that we can leverage across many different applications. Daytona was built knowing that we would want to publish it as open source and share the technology with the community for validation and improvement of the framework. We hope the community can help extend its use cases and make it suitable for an even broader set of applications and workloads. Daytona is comprised of a centralized scheduler, a distributed set of agents running on SUTs (systems under test), a MySQL database to store all metadata for tests, and a PHP-based UI. A test harness can be customized by answering a simple set of questions about the application/workload. A test can be submitted to Daytona’s queue through the UI or through a CLI (Command Line Interface) from the CI/CD system. The scheduler process polls the database for a test to be run and sends all the actions associated with the execution of the test to the agent running on a SUT. An agent process executes the test, collects application and system performance metrics, and sends the metrics back as a package to the scheduler. The scheduler saves the test metadata in the database and test results in the local file system. Tests from multiple harnesses proceed concurrently. Our goal is to integrate Daytona with popular open source CI/CD tools and we welcome contributions from the community to make that happen. It is available under Apache License Version 2.0. To evaluate Daytona, we provide simple instructions to deploy it on your in-house bare metal, VM, or public cloud infrastructure. We also provide instructions so you can quickly have a test and development environment up and running on your laptop with Docker. Please join us on the path of making application performance analysis an enjoyable and insightful experience. Visit the Daytona Yahoo repo to get started! Today, we are pleased to offer Athenz, an open-source platform for fine-grained access control, to the community. Athenz is a role-based access control (RBAC) solution, providing trusted relationships between applications and services deployed within an organization requiring authorized access. Integration with public cloud services like AWS. For example, launching an EC2 instance with a configured Athenz service identity or obtaining AWS temporary credentials based on authorization policies defined in ZMS. Our goal is to integrate Athenz with other open source projects that require authorization support and we welcome contributions from the community to make that happen. It is available under Apache License Version 2.0. To evaluate Athenz, we provide both AWS AMI and Docker images so that you can quickly have a test development environment up and running with ZMS (Athenz Management Service), ZTS (Athenz Token Service), and UI services. Please join us on the path to making application authorization easy. Visit http://www.athenz.io to get started! Today, Yahoo Mail introduced a feature that allows you to automatically sync your mobile photos to Yahoo Mail so that they’re readily available when you’re composing an email from your computer. 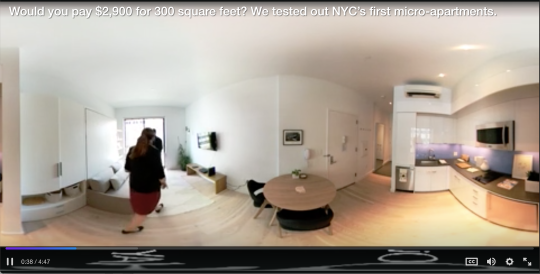 A key technology behind this feature is a new photo and video platform called “Tripod,” which was born out of the innovations and capabilities of Flickr. For 13 years, Flickr has served as one of the world’s largest photo-sharing communities and as a platform for millions of people who have collectively uploaded more than 13 billion photos globally. Tripod provides a great opportunity to bring some of the most-loved and useful Flickr features to the Yahoo network of products, including Yahoo Mail, Yahoo Messenger, and Yahoo Answers Now. The Pixel Service: for uploading, storing, resizing, editing, and serving photos and videos. The Enrichment Service: for enriching media metadata using image recognition algorithms. For example, the algorithms might identify and tag scenes, actions, and objects. The Aggregation Service: for in-application and cross-application metadata aggregation, filtering, and search. The combination of these three services makes Tripod an end-to-end platform for smart image services. There is also an administrative console for configuring the integration of an application with Tripod, and an identity service for authentication and authorization. 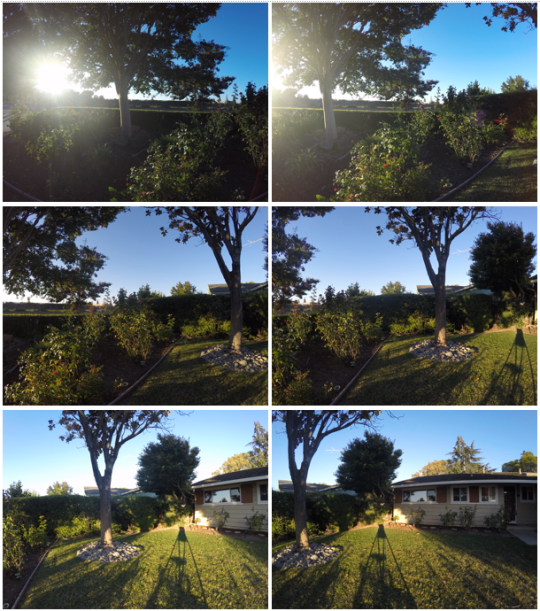 Flickr has achieved a highly-scalable photo upload and resizing pipeline. Particularly in the case of large-scale ingestion of thousands of photos and videos, Flickr’s mobile and API teams tuned techniques, like resumable upload and deduplication, to create a high-quality photo-sync experience. On serving, Flickr tackled the challenge of optimizing storage without impacting photo quality, and added dynamic resizing to support more diverse client photo layouts. Over many years at Flickr, we’ve demonstrated sustained uploads of more than 500 photos per second. The full pipeline includes the PHP Upload API endpoint, backend Java services (Image Daemon, Storage Master), hot-hot uploads across the US West and East Coasts, and five worldwide photo caches, plus a massive CDN. In Tripod’s Pixel Service, we leverage all of this core technology infrastructure as-is, except for the API endpoint, which is now written in Java and implements a new bucket-based data model. In 2013, Flickr made an exciting leap. Yahoo acquired two Computer Vision technology companies, IQ Engines and LookFlow, and rolled these incredible teams into Flickr. Using their image recognition algorithms, we enhanced Flickr Search and introduced Magic View to the Flickr Camera Roll. In Tripod, the Enrichment Service applies the image recognition technology to each photograph, resulting in rich metadata that can be used to enhance filtering, indexing, and searching. The Enrichment Service can identify places, themes, landmarks, objects, colors, text, media similarity, NSFW content, and best thumbnail. 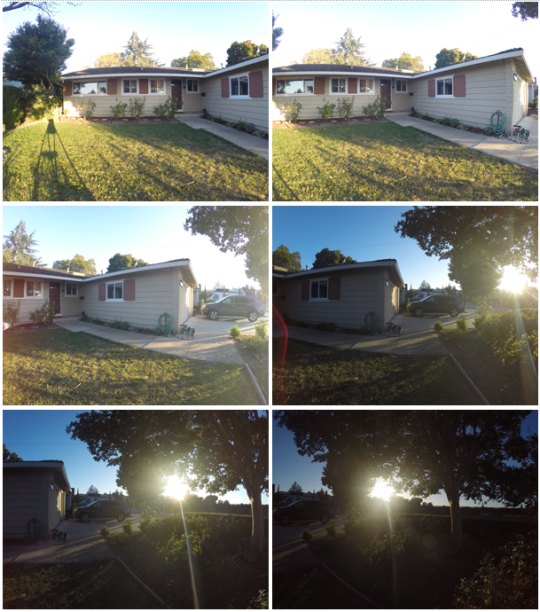 It also performs OCR text recognition and applies an aesthetic score to indicate the overall quality of the photograph. Vespa, Yahoo’s internal search engine, indexes all metadata for each media item. If the Enrichment Service has been run on the media, the metadata is indexed in Vespa and is available to the Aggregation API. The result set from a call to the Aggregation Service depends on authentication and the read permissions defined by an API key. Each service is expressed as a set of APIs. We upgraded our API technology stack, switching from PHP to Spring MVC on a Java Jetty servlet container, and made use of the latest Spring features such as Spring Data, Spring Boot, and Spring Security with OAuth 2.0. 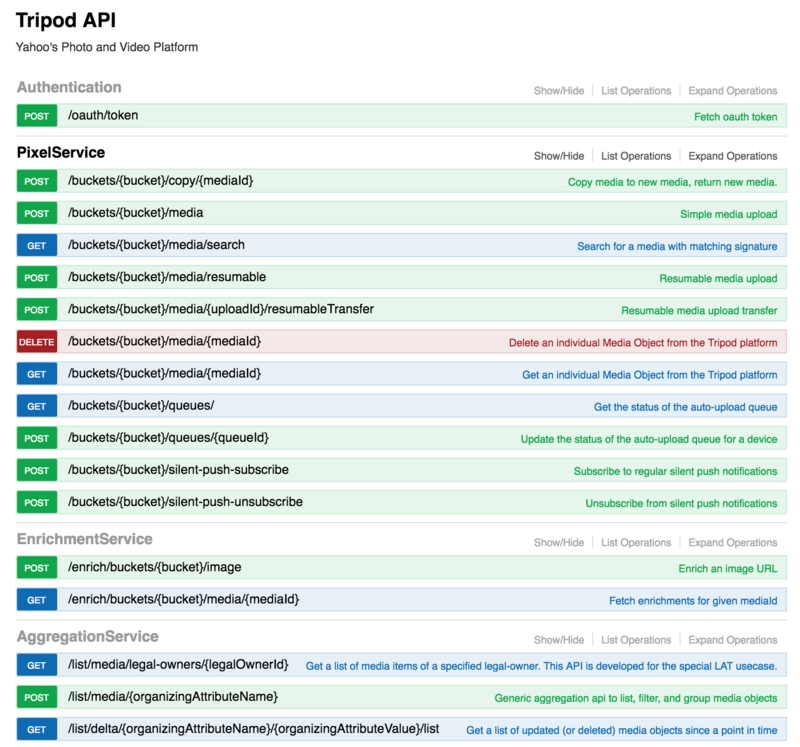 Tripod’s API is defined and documented using Swagger. Each service is developed and deployed semi-autonomously from a separate Git repository with a separate build lifecycle to an independent micro-service container. Swagger Editor makes it easy to auto-generate SDKs in many languages, depending on the needs of Yahoo product developers. 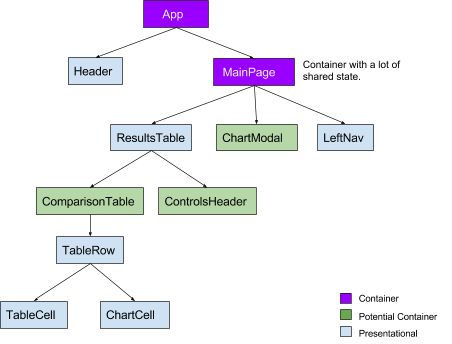 The mobile SDKs for iOS and Android are most commonly used, as is the JS SDK for Yahoo’s web developers. The SDKs make integration with Tripod by a web or mobile application easy. For example, in the case of the Yahoo Mail photo upload feature, the Yahoo Mail mobile app includes the embedded Tripod SDK to manage the photo upload process. The Tripod data model differs in some important ways from the Flickr data model. Tripod applications, buckets, and API keys introduce the notion of multi-tenancy, with a strong access control boundary. An application is simply the name of the application that is using Tripod (e.g. Yahoo Mail). 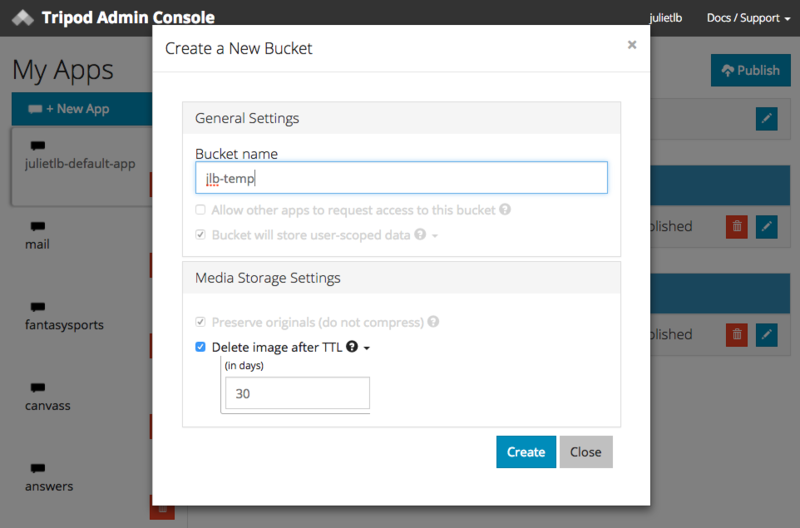 Buckets are logical containers for the application’s media, and media in an application is further affected by bucket settings such as compression rate, capacity, media time-to-live, and the selection of enrichments to compute. Beyond Tripod’s generic attributes, a bucket may also have custom organizing attributes that are defined by an application’s developers. 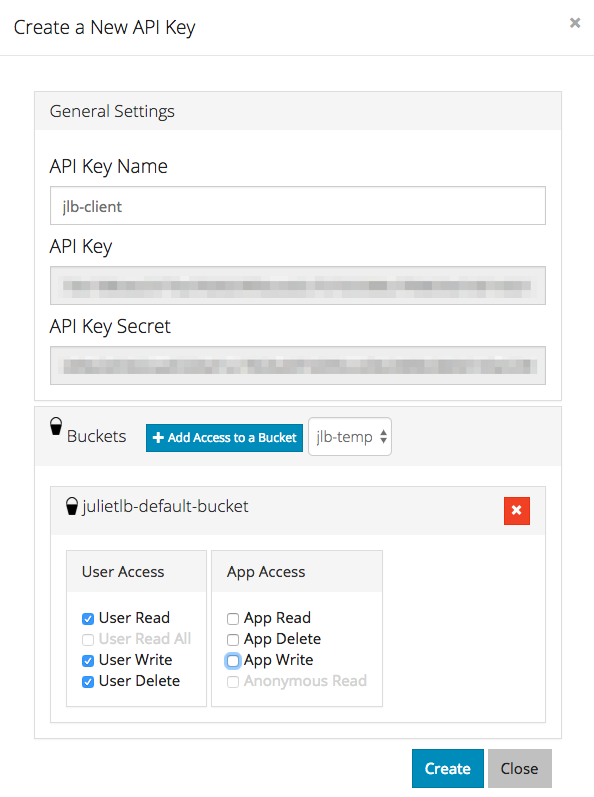 API keys control read/write permissions on buckets and are used to generate OAuth tokens for anonymous or user-authenticated access to a bucket. 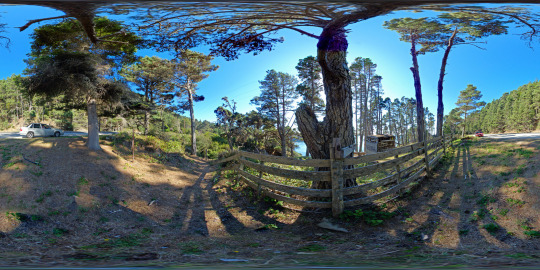 Another departure from the Flickr API is that Tripod can handle media that is not user-generated content (UGC). 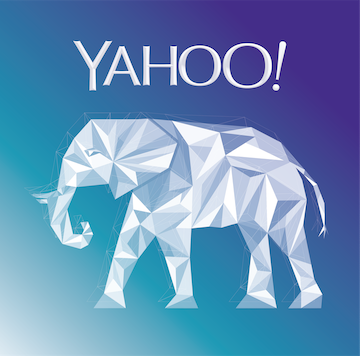 This is critical for storing curated content, as is required by many Yahoo applications. Going from a monolithic architecture to a microservices architecture has had its challenges. In particular, we’ve had to find the right internal communication process between the services. 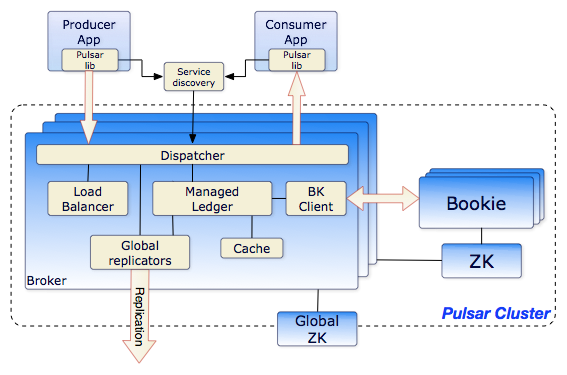 At the core of this is our Pulsar Event Bus, over which we send Avro messages backed by a strong schema registry. This lets each Tripod team move fast, without introducing incompatible changes that would break another Tripod service. For data persistence, we’ve moved most of our high-scale multi-colo data to Yahoo’s distributed noSQL database. We’ve been experimenting with using Redis Cluster as our caching tier, and we use Vespa to drive the Aggregation service. For Enrichment, we make extensive use of Storm and HBase for real-time processing of Tripod’s Computer Vision algorithms. Finally, we run large backfills using PIG, Oozie, and Hive on Yahoo’s massive grid infrastructure. In 2017, we expect Tripod will be at 50% of Flickr’s scale, with Tripod supporting the photo and video needs across many Yahoo applications that serve Yahoo’s 1B users across mobile and desktop. No! Flickr is still here, better than ever. In fact, Flickr celebrated its 13th birthday last week! Over the past several years, the Flickr team has implemented significant innovations on core photo management features (such as an optimized storage footprint, dynamic resizing, Camera Roll, Magic View, and Search). 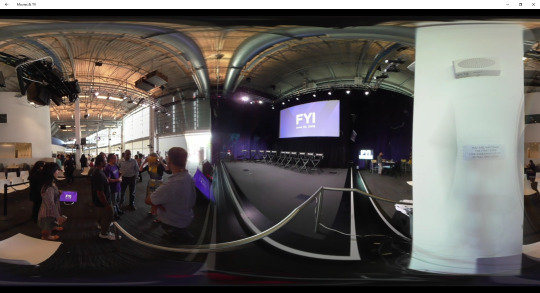 We wanted to make these technology advancements available to other teams at Yahoo! But, what about the Flickr API? Why not just use that? Flickr APIs are being used by hundreds of thousands of third-party developers around the world. Flickr’s API was designed for interacting with Flickr Accounts, Photos, and Groups, generally on lower scale than the Flickr site itself; it was not designed for independent, highly configurable, multi-tenant core photo management at large scale. We’re hiring and we’d love to talk to you about our open opportunities! Just email [email protected] to start the conversation. Today, we are pleased to offer TensorFlowOnSpark to the community, our latest open source framework for distributed deep learning on big-data clusters. Deep learning (DL) has evolved significantly in recent years. At Yahoo, we’ve found that in order to gain insight from massive amounts of data, we need to deploy distributed deep learning. 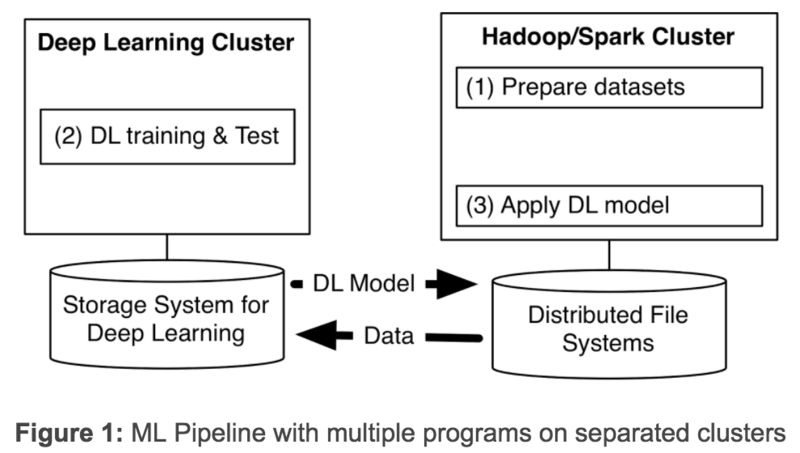 Existing DL frameworks often require us to set up separate clusters for deep learning, forcing us to create multiple programs for a machine learning pipeline (see Figure 1 below). Having separate clusters requires us to transfer large datasets between them, introducing unwanted system complexity and end-to-end learning latency. Last year we addressed scaleout issues by developing and publishing CaffeOnSpark, our open source framework that allows distributed deep learning and big-data processing on identical Spark and Hadoop clusters. We use CaffeOnSpark at Yahoo to improve our NSFW image detection, to automatically identify eSports game highlights from live-streamed videos, and more. With the community’s valuable feedback and contributions, CaffeOnSpark has been upgraded with LSTM support, a new data layer, training and test interleaving, a Python API, and deployment on docker containers. This has been great for our Caffe users, but what about those who use the deep learning framework TensorFlow? We’re taking a page from our own playbook and doing for TensorFlow for what we did for Caffe. After TensorFlow’s initial publication, Google released an enhanced TensorFlow with distributed deep learning capabilities in April 2016. In October 2016, TensorFlow introduced HDFS support. Outside of the Google cloud, however, users still needed a dedicated cluster for TensorFlow applications. TensorFlow programs could not be deployed on existing big-data clusters, thus increasing the cost and latency for those who wanted to take advantage of this technology at scale. To address this limitation, several community projects wired TensorFlow onto Spark clusters. SparkNet added the ability to launch TensorFlow networks in Spark executors. DataBricks proposed TensorFrame to manipulate Apache Spark’s DataFrames with TensorFlow programs. While these approaches are a step in the right direction, after examining their code, we learned we would be unable to get the TensorFlow processes to communicate with each other directly, we would not be able to implement asynchronous distributed learning, and we would have to expend significant effort to migrate existing TensorFlow programs. TensorFlowOnSpark supports all types of TensorFlow programs, enabling both asynchronous and synchronous training and inferencing. It supports model parallelism and data parallelism, as well as TensorFlow tools such as TensorBoard on Spark clusters. Any TensorFlow program can be easily modified to work with TensorFlowOnSpark. Typically, changing fewer than 10 lines of Python code are needed. 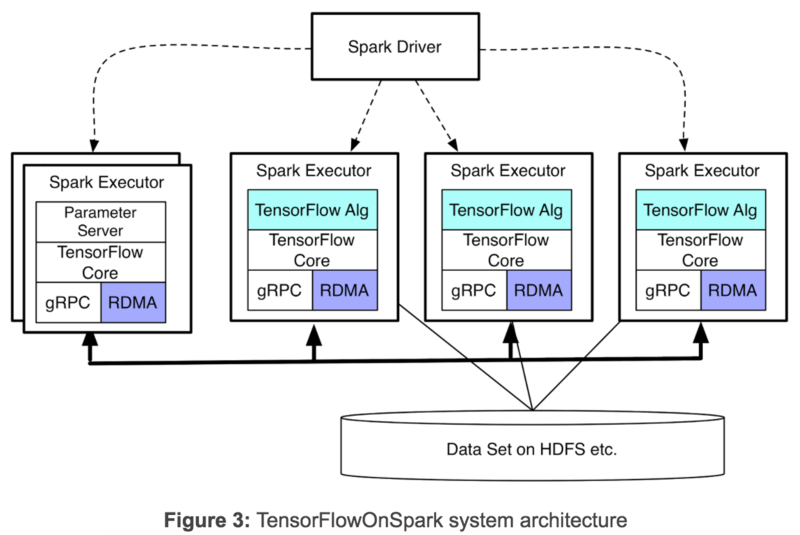 Many developers at Yahoo who use TensorFlow have easily migrated TensorFlow programs for execution with TensorFlowOnSpark. TensorFlowOnSpark supports direct tensor communication among TensorFlow processes (workers and parameter servers). Process-to-process direct communication enables TensorFlowOnSpark programs to scale easily by adding machines. As illustrated in Figure 3, TensorFlowOnSpark doesn’t involve Spark drivers in tensor communication, and thus achieves similar scalability as stand-alone TensorFlow clusters. TensorFlow QueueRunners: TensorFlowOnSpark leverages TensorFlow’s file readers and QueueRunners to read data directly from HDFS files. Spark is not involved in accessing data. Spark Feeding: Spark RDD data is fed to each Spark executor, which subsequently feeds the data into the TensorFlow graph via feed_dict. Figure 4 illustrates how the synchronous distributed training of Inception image classification network scales in TFoS using QueueRunners with a simple setting: 1 GPU, 1 reader, and batch size 32 for each worker. Four TFoS jobs were launched to train 100,000 steps. When these jobs completed after 2+ days, the top-5 accuracy of these jobs were 0.730, 0.814, 0.854, and 0.879. Reaching top-5 accuracy of 0.730 takes 46 hours for a 1-worker job, 22.5 hours for a 2-worker job, 13 hours for a 4-worker job, and 7.5 hours for an 8-worker job. TFoS thus achieves near linear scalability for Inception model training. This is very encouraging, although TFoS scalability will vary for different models and hyperparameters. In Yahoo’s Hadoop clusters, GPU nodes are connected by both Ethernet and Infiniband. Infiniband provides faster connectivity and supports direct access to other servers’ memories over RDMA. Current TensorFlow releases, however, only support distributed learning using gRPC over Ethernet. To speed up distributed learning, we have enhanced the TensorFlow C++ layer to enable RDMA over Infiniband. In conjunction with our TFoS release, we are introducing a new protocol for TensorFlow servers in addition to the default “grpc” protocol. Any distributed TensorFlow program can leverage our enhancement via specifying protocol=“grpc_rdma” in tf.train.ServerDef() or tf.train.Server(). With this new protocol, a RDMA rendezvous manager is created to ensure tensors are written directly into the memory of remote servers. We minimize the tensor buffer creation: Tensor buffers are allocated once at the beginning, and then reused across all training steps of a TensorFlow job. From our early experimentation with large models like the VGG-19 network, our RDMA implementation has demonstrated a significant speedup on training time compared with the existing gRPC implementation. Since RDMA support is a highly requested capability (see TensorFlow issue #2916), we decided to make our current implementation available as an alpha release to the TensorFlow community. In the coming weeks, we will polish our RDMA implementation further, and share detailed benchmark results. TFoS programs are launched by the standard Apache Spark command, spark-submit. As illustrated below, users can specify the number of Spark executors, the number of GPUs per executor, and the number of parameter servers in the CLI. A user can also state whether they want to use TensorBoard (–tensorboard) and/or RDMA (–rdma). Yahoo is happy to release TensorFlowOnSpark at github.com/yahoo/TensorFlowOnSpark and a RDMA enhancement of TensorFlow at github.com/yahoo/tensorflow/tree/yahoo. Multiple example programs (including mnist, cifar10, inception, and VGG) are provided to illustrate the simple conversion process of TensorFlow programs to TensorFlowOnSpark, and leverage RDMA. An Amazon Machine Image is also available for applying TensorFlowOnSpark on AWS EC2. 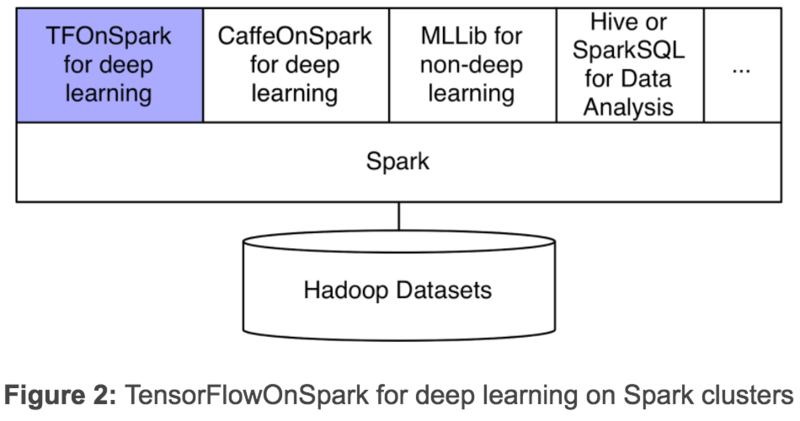 Going forward, we will advance TensorFlowOnSpark as we continue to do with CaffeOnSpark. We welcome the community’s continued feedback and contributions to CaffeOnSpark, and are interested in thoughts on ways TensorFlowOnSpark can be enhanced. Continuous Delivery enables software development teams to move faster and adapt to users’ needs quicker by reducing the inherent friction associated with releasing software changes. Yahoo’s engineering has modernized as it has embraced Continuous Delivery as a strategy for improving product quality and engineering agility. All our active products deliver from commit to production with full automation and this has greatly improved Yahoo’s ability to deliver products. Part of what enabled Yahoo to make Continuous Delivery at scale a reality was our improved build and release tooling. 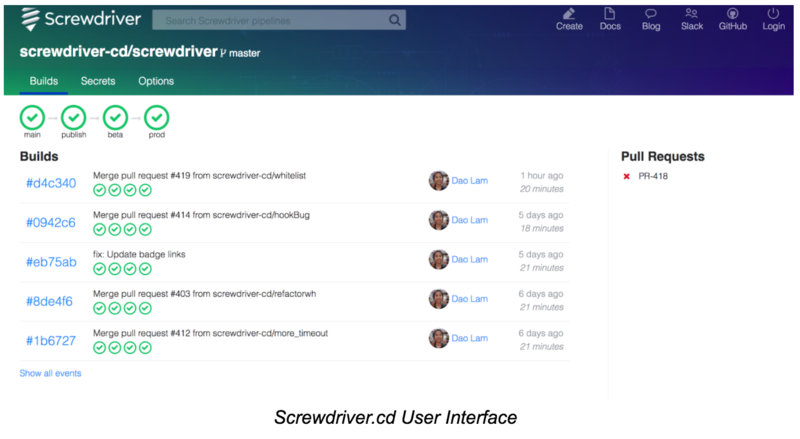 Now, we are open sourcing an adaptation of our code as Screwdriver.cd, a new streamlined build system designed to enable Continuous Delivery to production at scale for dynamic infrastructure. Easy deployment pipelines: Deployment pipelines that continuously test, integrate, and deploy code to production greatly reduce the risk of errors and reduce the time to get feedback to developers. The challenge for many groups had been that pipelines were cumbersome to setup and maintain. We designed a solution that made pipelines easy to configure and completely self-service for any developer. By managing the pipeline configuration in the code repository Screwdriver allows developers to configure pipelines in a manner familiar to them, and as a bonus, to easily code review pipeline changes too. Trunk development: Internally, we encourage workflows where the trunk is always shippable. Our teams use a modified GitHub flow for their workflows. Pull Requests (PRs) are the entry point for running tests and ensuring code that entered the repository has been sufficiently tested. Insisting on formal PRs also improves the quality of our code reviews. To ensure trunks are shippable, we enable functional testing of code in the PRs. Internally, this is a configuration baked into pipelines that dynamically allocates compute resources, deploys the code, and runs tests. These tests include web testing using tools like Selenium. These dynamically-allocated resources are also available for a period after the PR build, allowing engineers to interact with the system and review visual aspects of their changes. Easy rollbacks: To allow for easy code rollbacks, we allow phases of the pipeline to be re-run at a previously-saved state. We leverage features in our PaaS to handle the deployment, but we store and pass metadata to enable us to re-run from a specific git SHA with the same deployment data. This allows us to roll back to a previous state in production. This design makes rolling back as easy as selecting a version from a dropdown menu and clicking “deploy.” Anyone with write access to the project can make this change. This helped us move teams to a DevOps model where developers were responsible for the production state. 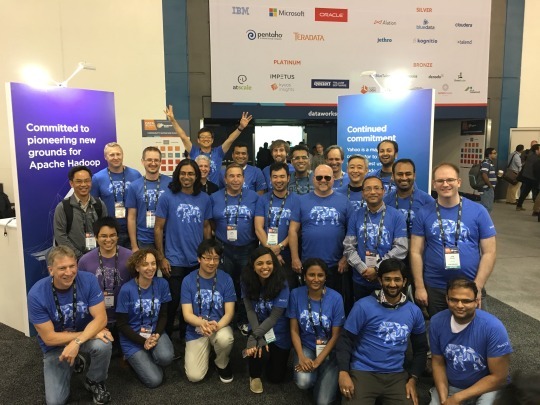 The successful growth of Screwdriver over the past 5 years at Yahoo has today led to Screwdriver being synonymous with Continuous Delivery within the company. Screwdriver handles over 25,000+ builds per day and 12,000+ daily git commits as a single shared entrypoint for Yahoo. It supports multiple languages and handles both virtual machine and container-based builds and deployment. 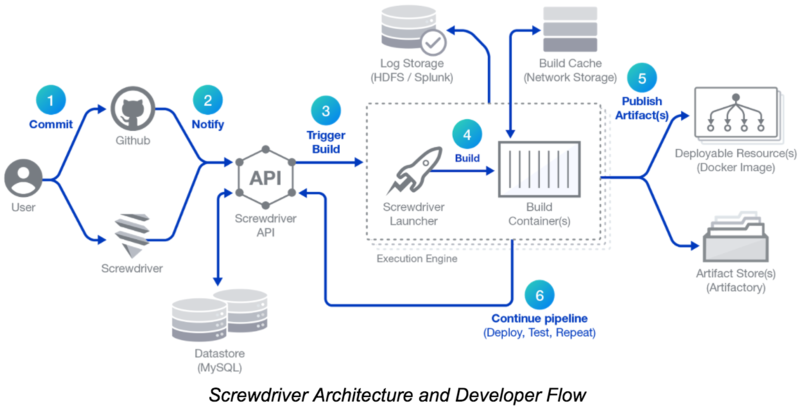 Screwdriver.cd’s architecture is comprised of four main components: a frontend for serving content to the user, a stateless API that orchestrates between user interactions and build operations, the execution engines (Docker Swarm, Kubernetes, etc.) that checkout source code and execute in containers, and the launcher that executes and monitors commands inside the container. The diagram below shows this architecture overlaid with a typical developer flow. To give some context around our execution engines, internal Screwdriver started as an abstraction layer on top of Jenkins and used Docker to provide isolation, common build containers, etc. We used features provided by Jenkins plugins to leverage existing work around coverage and test reports. However, as Screwdriver usage continued to climb, it outgrew a single Jenkins cluster. So in order to grow to our needs, we added capabilities in Screwdriver that allowed us to scale horizontally while also adding capabilities to schedule pipelines across a number of Jenkins clusters. As we scaled Screwdriver, we used less from Jenkins and built more supporting services utilizing our cloud infrastructure. The open-source version is focused on Kubernetes and Docker Swarm as our primary supported execution engines. Please join us on the path to making Continuous Delivery easy. Visit http://screwdriver.cd to get started. What’s the first thing you want to know about any kind of text document (like a Yahoo News or Yahoo Sports article)? What it’s about, of course! That means you want to know something about the people, organizations, and locations that are mentioned in the document. Systems that automatically surface this information are called named entity recognition and linking systems. These are one of the most useful components in text analytics as they are required for a wide variety of applications including search, recommender systems, question answering, and sentiment analysis. Named entity recognition and linking systems use statistical models trained over large amounts of labeled text data. A major challenge is to be able to accurately detect entities, in new languages, at scale, with limited labeled data available, and while consuming a limited amount of resources (memory and processing power). After researching and implementing solutions to enhance our own personalization technology, we are pleased to offer the open source community Fast Entity Linker, our unsupervised, accurate, and extensible multilingual named entity recognition and linking system, along with datapacks for English, Spanish, and Chinese. Yahoo – linked to https://en.wikipedia.org/wiki/Yahoo! On the algorithmic side, we use entity embeddings, click-log data, and efficient clustering methods to achieve high precision. The system achieves a low memory footprint and fast execution times by using compressed data structures and aggressive hashing functions. Entity embeddings are vector-based representations that capture how entities are referred to in context. We train entity embeddings using Wikipedia articles, and use hyperlinked terms in the articles to create canonical entities. The context of an entity and the context of a token are modeled using the neural network architecture in the figure below, where entity vectors are trained to predict not only their surrounding entities but also the global context of word sequences contained within them. In this way, one layer models entity context, and the other layer models token context. We connect these two layers using the same technique that (Quoc and Mikolov ‘14) used to train paragraph vectors. Architecture for training word embeddings and entity embeddings simultaneously. Ent represents entities and W represents their context words. *Currently, only the Forward Backward Algorithm is available in our open source release–the other two will be made available soon! These algorithms are particularly helpful in accurately linking entities when a popular candidate is NOT the correct candidate for an entity mention. 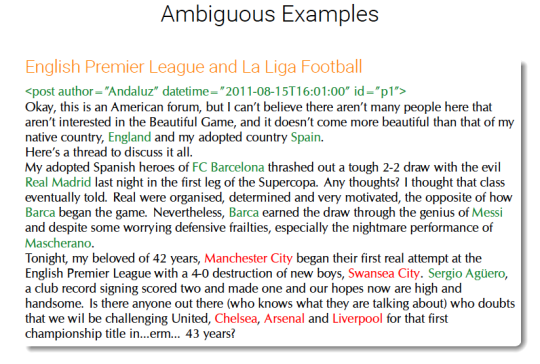 In the example below, these algorithms leverage the surrounding context to accurately link Manchester City, Swansea City, Liverpool, Chelsea, and Arsenal to their respective football clubs. Ambiguous mentions that could refer to multiple entities are highlighted in red. For example, Chelsea could refer to Chelsea Football team or Chelsea neighborhood in New York or London. Unambiguous named entities are highlighted in green. Examples of candidate retrieval process in Entity Linking for both ambiguous and unambiguous examples referred in the example above. The correct candidate is highlighted in green. At this time, Fast Entity Linker is one of only three freely-available multilingual named entity recognition and linking systems (others are DBpedia Spotlight and Babelfy). In addition to a stand-alone entity linker, the software includes tools for creating and compressing word/entity embeddings and datapacks for different languages from Wikipedia data. As an example, the datapack containing information from all of English Wikipedia is only ~2GB. Roi Blanco, Giuseppe Ottaviano, and Edgar Meij: “Fast and space-efficient entity linking in queries.” In Proceedings WDSM 2015. Aasish Pappu, Roi Blanco, Yashar Mehdad, Amanda Stent, and Kapil Thadani: “Lightweight multilingual entity extraction and linking.” In Proceedings WSDM 2017. There are numerous possible applications of the open-source toolkit. One of them is attributing sentiment to entities detected in the text, as opposed to the entire text itself. For example, consider the following actual review of the movie “Inferno” from a user on MetaCritic (revised for clarity): “While the great performance of Tom Hanks (wiki_Tom_Hanks) and company make for a mysterious and vivid movie, the plot is difficult to comprehend. Although the movie was a clever and fun ride, I expected more from Columbia (wiki_Columbia_Pictures).” Though the review on balance is neutral, it conveys a positive sentiment about wiki_Tom_Hanks and a negative sentiment about wiki_Columbia_Pictures. Many existing sentiment analysis tools collate the sentiment value associated with the text as a whole, which makes it difficult to track sentiment around any individual entity. With our toolkit, one could automatically extract “positive” and “negative” aspects within a given text, giving a clearer understanding of the sentiment surrounding its individual components. Feel free to use the code, contribute to it, and come up with addtional applications; our system and models are available at https://github.com/yahoo/FEL. Great work from our Yahoo Research team! This post also appears on the ATS blog, https://blogs.apache.org/trafficserver. 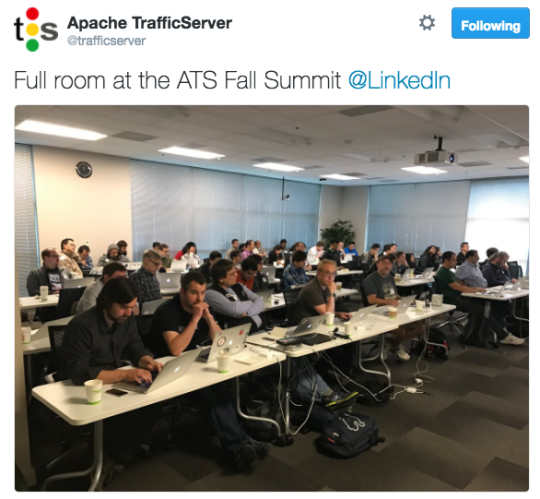 Last week, the ATS Community held a productive and informative Apache Traffic Server (ATS) Fall Summit, hosted by LinkedIn in Sunnyvale, CA. At a hackathon during the Summit, we fixed bugs, cleaned up code, users were able to spend time with experts on ATS and have their questions answered, and the next release candidate for ATS 7.0.0 was made public. There were talks on operations, new and upcoming features, and supporting products. More than 80 people registered for the event and we had a packed room with remote video conferencing. I have been attending the ATS Summits since their inception in 2010 and have had the pleasure of being involved with the Apache Traffic Server Project for the last nine years. I was also part of the team at Yahoo that open sourced the code to Apache. Today, I am honored to serve as the new Chair and VP of the ATS Project, having been elected to the position by the ATS community a couple weeks ago.